Since suffering a major E. coli outbreak in 2015, Chipotle has focused on refreshing its reputation by closing all its stores for a daylong food safety training and offering customers free burritos. Though we hoped the company’s woes were behind it, a Chipotle location in Sterling, Va., was temporarily closed in July 2017 after what has been confirmed to be a norovirus outbreak. Chipotle’s benefits list says paid time off (including sick time) is offered to hourly employees, but the restaurant’s recent outbreak was, like many others in the foodservice industry, traced to a sick employee. The fast-casual restaurant isn’t alone, of course: According to the CDC, food workers cause 70 percent of norovirus outbreaks. That includes those occurring in health care facilities and banquet facilities, as well as restaurants. Norovirus causes acute gastroenteritis symptoms that may last several days and can contaminate food when it is handled by someone who is contagious. The CDC indicates the foodborne illness, which can infect another person with fewer than 20 particles, is most likely to be transferred by someone who is currently sick or has recently recovered. Obviously none of us wants someone who’s possibly contagious handling our food, but for a foodservice employee trying to make ends meet, just staying home isn’t always an option. Chipotle’s paid sick leave was one of several new food safety measures added in response to its foodborne illness outbreaks in 2015, but many who work in foodservice operations aren’t offered any paid sick days. 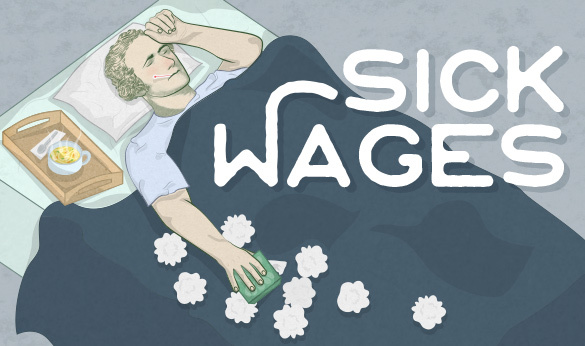 These employees may believe going to work while sick isn’t a choice but a necessity, especially because tipped and untipped workers are often paid minimum wage. One of the other common reasons given for working sick – “don’t want to let co-workers down” – is a reflection of the demanding environment that exists in many commercial kitchens. Understaffing caused by a shortage of experienced cooks and the long hours most commercial kitchen employees already work mean that calling out, even if you’re sick, puts additional stress on other chefs and the rest of the crew. In a Toronto Life article, author and former cook Corey Mintz had some discouraging words about the attitudes found in most commercial kitchens. Although not calling out of work when you’re sick may be something of a badge of honor for restaurant cooks, some cities and states are making paid sick days mandatory. According to data compiled by New York-based advocacy organization A Better Balance, San Francisco was the first city to pass paid sick day legislation in 2006, with Connecticut becoming the first state to do so in 2011. Other states with paid sick day laws include Arizona, California, Oregon, and Washington; more than two dozen other local governments have also required guaranteed paid sick days. Paid sick day legislation mandates the accrual of a certain amount of time per hours worked, usually 1 hour per every 30 or 40 hours worked (although this varies between cities and states). However, there are usually conditions for aspects of the law such as which businesses must provide paid sick time, which employees are covered, when and how an employee’s accrued time can be spent, and how much accrued time an employee can hold at once. The laws are also designed to protect employees from being punished by their employers for utilizing their accrued time. This is part of an ongoing series about restaurant wages. Previous installments discuss the tip pool and eliminating tips.